The Outdoor Kitchen packs everything you need for cooking alfresco, from a sink to a gas burner, into a single, ingenious mobile cart. No more having to shuttle tons of equipment between the house and the patio whenever you want to barbecue. Even better, you can build the kitchen yourself with stuff you’d find lying around in the garage. The best part: The instructions are downloadable. Get them for free (go here). It’s one of several open-source DIY projects available from the British design firm Studiomama. The company’s owner, Nina Tolstrup, comes up with easy-to-assemble furniture — a playhouse made in part of Legos; chairs, lights, and stools made of pallets — then posts the instructions on her website gratis or for a small charge. The most expensive design is the playhouse; it’s $50. The concepts are pretty damn clever, especially the Outdoor Kitchen. It has broomsticks for joints. The sink is a bucket that links up to your garden hose. And a watering can collects gray water, which can be reused to sprinkle plants in the backyard. 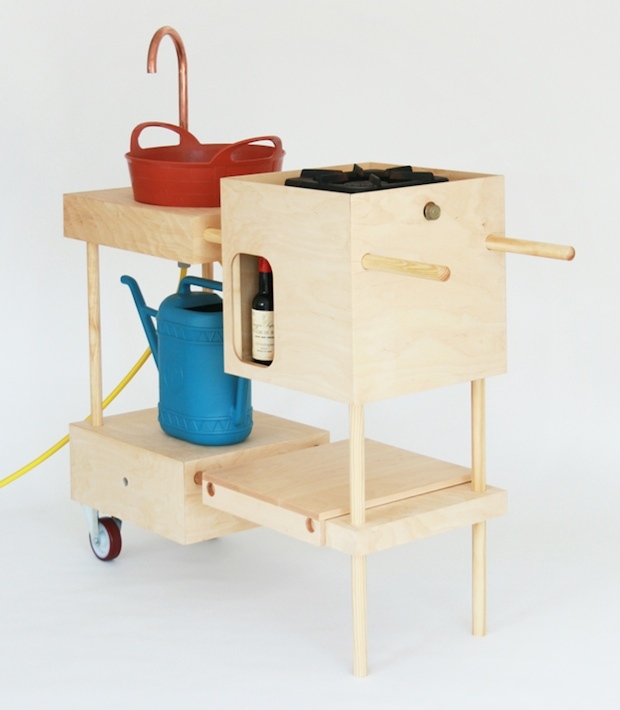 The Outdoor Kitchen debuted at London Design Festival last month. For more info, visit Studiomama’s website, and for more Co.Design coverage of innovative DIY projects, click here.